Launching National Schools Film Week, BAFTA has played host to some talented young film critics for the Young Film Critic of the Year awards. Budding young journalists made their way to London’s Piccadilly on Friday for a star-studded Young Film Critic of the Year awards ceremony at the British Academy of Film and Television Arts (BAFTA). Hosted by broadcaster and former Blue Peter presenter, Katy Hill, the awards offered a once-in-a-lifetime opportunity for young writers between the ages of 4 and 19. The competition, organised by Film Education, offered awards for the best Young Film Critic in two age groups (11 to 14 and 15 to 19), best Junior Film Critic (7 to 11 years), and best Mini Film Fan (4 to 7 years). There were also separate Sensory Impaired categories in the Junior and Young Film Critic groups. James Cave (age 6) of Manuden Primary School in Bishop’s Stortford, who was chosen as Mini Film Fan for 2008 for his artistic representation of the character of Granny from the animated film Hoodwinked. 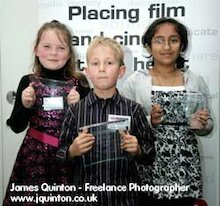 Young Film Critics of the Year: (left to right) Ruby Daniels, James Cave and Niva Rajendran. The awards were presented by some top names in the world of cinema including film maker Beeban Kidron (director of Bridget Jones, The Edge of Reason), Simon Hewlett, Managing Director of Universal Pictures International UK and Ireland, and Ed Boase, Director of the Young Film Academy. Winners’ prizes included Yamaha Theatre systems and digital SLR cameras for the children and £1000 Promethean technology grants for the winners’ schools. Runners-up were given Film Goody Bags. Ruby, who wants to be a literacy teacher when she leaves school, chose to review Kung Fu Panda for the Film Education competition because the idea of a fat panda doing Kung Fu appealed to her. It was also a film she had really enjoyed watching in the cinema. Luckily for Ruby, the judges not only accepted her review, they considered it special enough to win the award in the Junior Film Critic category. The awards ceremony kicked off National Schools Film Week, which runs from 20th to 24th October in England, Northern Ireland and Wales and from 3rd to 7th November in Scotland. During the festival, schools can take their children to one of 2,000 free screenings of 190 different films in local cinemas in more than 560 different locations across the country. This means that more than 400,000 young people could have access to a film viewed on the big screen. For more information about NSFW and screenings in your area, visit the NSFW website.